For anyone out there who knows me, it should come as no surprise that I have not been doing much in the kitchen while it's so hot and humid here in the Windy City. Much as I love to cook, I love my comfort more. You won't see me sweating over a hot stove unless I can cool off the minute I walk away from it. Our summers are usually mild enough, though, that I can get some good cooking and baking days in and around the heat. But this summer it feels like it slammed up into the 90s early in June and hasn't looked back. Even my friends who love summer are complaining. And if they're complaining, you can imagine my comments on the subject. I am managing to do some cooking, but it's sporadic and minimal stove top, with lots of salads and raw vegetables. I finally found a brand of peanut butter that isn't too terrible (but it's no Valencia Peanut Butter) and I'm :gasp: buying bread, but I am managing to survive without resorting to take-out or delivery. (Not that I'm not taking advantage of that option, but only twice so far, which I think is pretty good.) I have even started a post about things to make when it's too hot to cook, but I don't even feel like writing in this heat. I am jonesing to get back into the kitchen. Last weekend it almost felt cool enough to make pasta. I am dreaming about pizza dough and biscuits. I have a bunch of beautiful red onions a friend gave me from her CSA basket while she is out of town and I so want to make an onion tart! But that will have to wait. This heat can't last forever, can it? In the meantime, I will share with you the last thing I did bake before it got so hot. 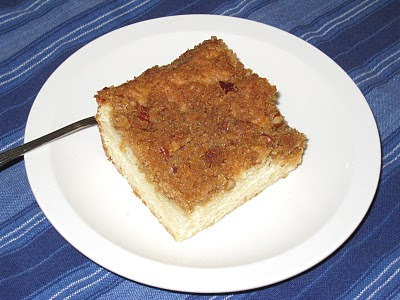 I believe my earliest cake memory is this streusel cake that my mother made often when I was young. I believe it was my grandmother's recipe. I have nothing but a vague memory to back that up, but I'm pretty sure I'm right, especially since there's no chocolate in it so I don't think my mother would have made this without having already been exposed to it. She would make it to offer to friends when they could come over for a visit over a cup of coffee. I remember I really liked it when I was young. The cake itself was nothing special, but ooh that streusel topping! Sweet and nutty, with a hint cinnamon to warm it up, it was just as good with milk as I'm sure it was with coffee. I've only made it a few times myself, and it had been a while since the last time I had made it. I was struck by how similar the cake batter is to biscuits, now that I've been making those on a regular bases (or had been making them, before this godawful heat). Take out the sugar and vanilla, and you have the makings of biscuit dough. I don't know why that tickles me, but it does. But you will not feel like you're eating biscuits when you take a bite of this cake. It is sturdy, which makes it the perfect companion for a nice cup of hot coffee or glass of cold milk, either of which literally make the streusel topping melt in your mouth. Preheat the oven to 350 deg. F. Grease a 9 by 13-inch rectangular cake pan. Sift flour, sugar, baking powder, and salt into a medium-sized mixing bowl. Cut the butter into the dry mixture with a pastry cutter, two knives, or your fingers. Add the eggs, milk, and vanilla to the dry ingredients. Stir just enough to mix. Pour into greased pan. Combine all of the ingredients for the streusel mixture in a small bowl. Sprinkle evenly over the cake mixture. Bake at 350 deg. F for 20-25 minutes, until toothpick or knife inserted into the center of the cake comes out clean.